The nefarious turtle, Devan Shell, has built a time machine as part of a diabolical plan to rewrite Carrotus’ past. Now, only our hero along with his spaced-out little brother, Spaz, can stop him from turning history on its ear! Jazz, the PC platform hero, has finally made comeback with all new adventures. This time he’s brought with him not only his space cadet brother Spaz, but also their sister, Lori – and she has supernatural athletic powers! This story, completely fresh and new for our gamers, takes our favourite rabbits to a haunted house, a city and an extended Easter level! On their way they encounter numerous enemies and sneaky adversaries, but trust them to bring the game to a wild conclusion when they find a mysterious code which is the key to the Valhalla. They are back! 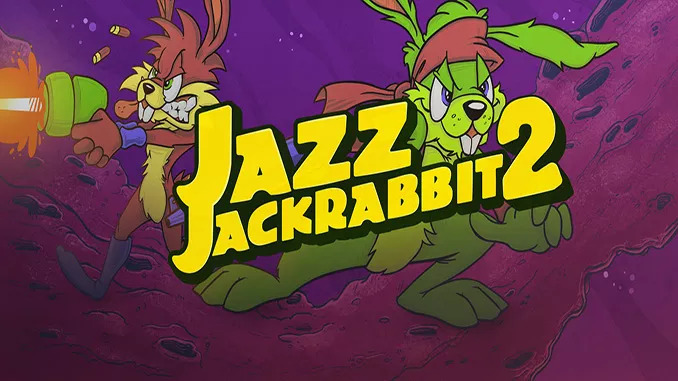 Super-cool rabbit jazz, his crazy little brother, Spaz, and their athletic sister Lori will gang up for Christmas to have a wild and wacky time on your PC. 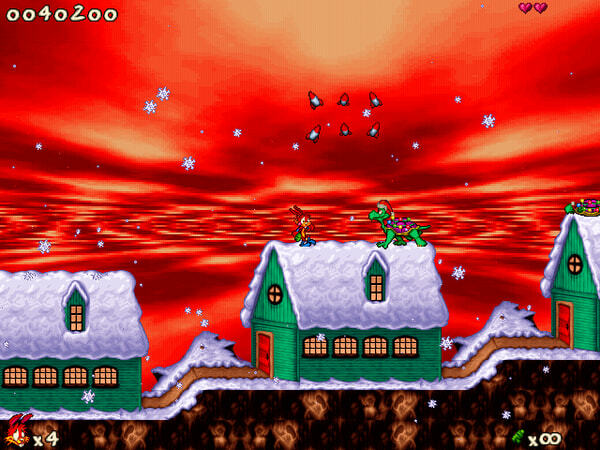 In these Christmas levels of the PC hit Jazz Jackrabbit 2, our favourite rabbits have brand new adventures in cold, snowy landscapes, where there are many evil enemies. – Incredibly fast-paced game play. – Choice of at least three characters, each with its own specific gaming features. 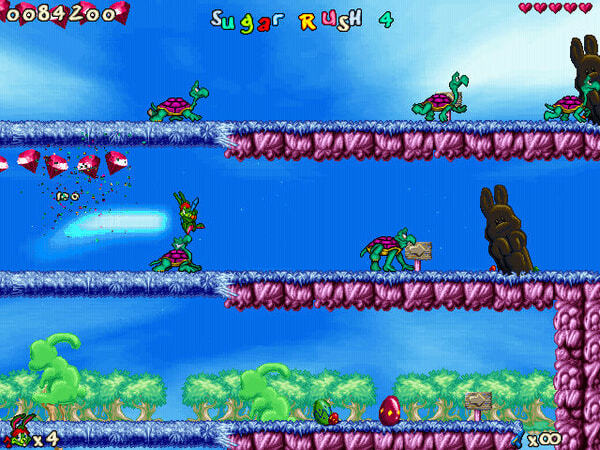 – Fly, swim and warp your way through over 40 levels of non-stop action. 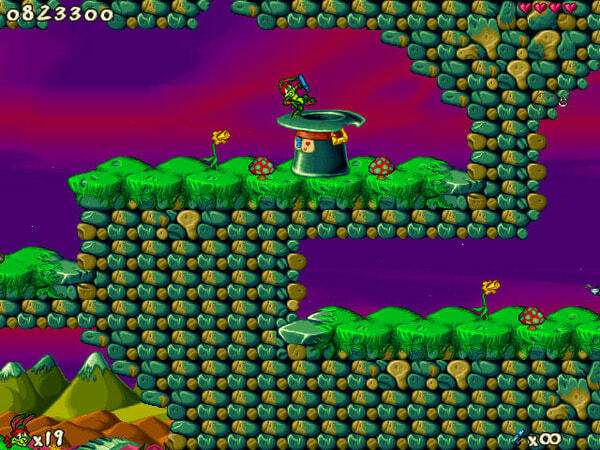 – Jazz Creation Station, a super-friendly level editor, enabling players to create their own levels. – Deliriously fun Party Mode: Jazz up your social life with four-mode multiplayer gaming; two to four players on one screen; up to eight players on two screens via modem; up to 32 players on eight screens via LAN or the Internet! The nefarious turtle, Devan Shell, has built a time machine as part of a diabolical plan to rewrite Carrotus’ past. Works with Windows 98, and on. Perfectly. This is one of the first game I ever played, and I liked it since the start.